Lines for Life is a nonprofit organization that helps prevent substance abuse and suicide. We also work to promote better mental health, improved access to mental health services, and to diminish public health threats such as the current epidemic of prescription opioid overdoses in the U.S.
We promote healthy youth and communities. To do that, we run outreach programs that promote drug and alcohol awareness, we create and manage substance abuse prevention programs, and we work on public policy (such as legislation) to promote high standards of mental and physical health. The most public way that we help keep people safe is by managing a dedicated series of crisis lines. 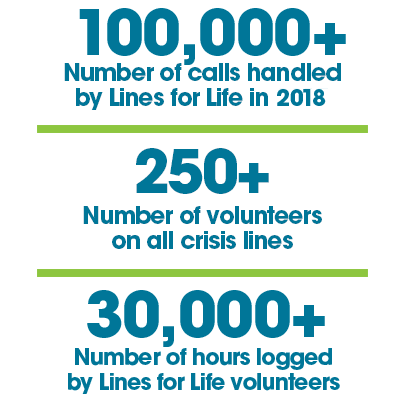 Lines for Life is an affiliate of the National Suicide Prevention Lifeline, and a national backup center for the Veterans Crisis Line (hosted by the Veterans Administration). We also manage a Military Helpline, a YouthLine with peer-to-peer counseling for teens, a Drug & Alcohol Helpline, and we contract with city and county governments to provide coverage for regional crisis lines. Last year our 24-hour crisis lines, overseen by licensed clinicians, handled nearly 78,000 calls. Lines for Life is a 501(c)(3) nonprofit organization. Our fiscal year ends June 30th.